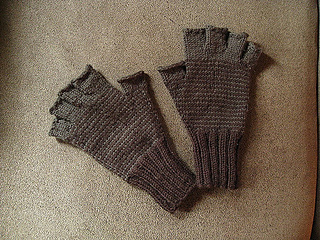 After scouring the web in vain for fingerless glove patterns in a size men’s small, I decided to write my own. 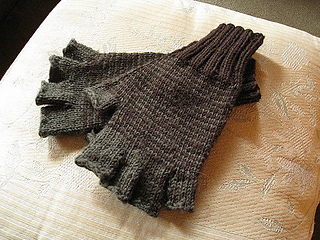 These gloves have a brown cuff, alternating rows of brown and green for the hand, and green fingers. This uses approximately equal amounts of each color, and gives a pleasing transition from one color to the other. Use two subtly different colors for a sleek look, or two bold, contrasting colors for a more psychedelic fade. They would be great for using up remnants of sport-weight or DK wool – about 85 yards of each color are needed. The tight gauge keeps out the wind and the cold and makes them feel quite sturdy, but not too thick. Although they were originally designed to fit a men’s size small hand, they’d also fit a medium/large women’s hand. Edited, 12/14/09: There was a small typo where the thumb is set aside that has been fixed. The new and improved pdf is now up!